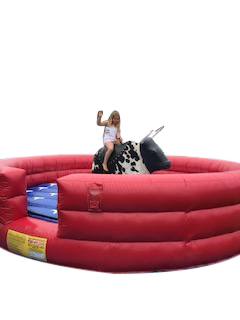 Safety, with Mechanical Bulls, is very important to us just like it is with you. We maintain safety in many areas when running the bull. Our bull is surrounded by a 16' x 16' air mattress. This is inflated fully and the bull will never be run without it in place. The constant airflow allows the mat to be inflated and offer maximum protection at all times. The bull's head and horns are also padded - they are very soft. When riding the bull you will hold onto a rope instead of a strap or metal post. This allows for safer dismount from the bull if you fall off. There are various speeds in which the bull operates. These different speeds allow anyone, regardless of age or ability, to safely ride the bull. There is a qualified and trained operator running the bull at all times. The operator has been educated in the importance of mechanical bull safety. They are in control of: the speed, the buck-and-spin, and the direction of the spin. Every ride is customized to ensure it to be fun and safe no matter what the age of the rider. This is for a 3 hour rental. You can add an additional hour at $125 per hour. Dimensions: A 20' x 20' area for the inflatable mattress, blower and control stand is needed. Outlets: 2 seperate circuits: 1 Circuit for Blower= 7.5amps 2nd circuit for Main Power 10-16amps depending on the weight of the player Generator Rentals are available. Attendants/Monitors: This item requires (1) Attendant to stay with the unit while in use that is included in the rental price. Waivers: All participants are required to fill out a waiver per event. Participants under the age of 18 are required to have parent signature on file, or filled out and given to the operator.